Stylish happenings are afoot this week. 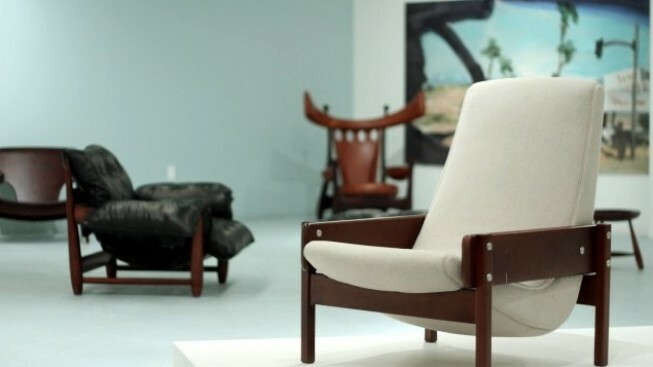 Check out the new Sergio Rodrigues shop-in-shop at Espasso Los Angeles. There's maybe only one thing that tickles our fancy more than the random, not-there-yesterday-but-here-today pop-up shop. But something even a bit stranger and a tad meta? The shop-within-a-shop. We certainly don't take a shine to every single one that comes down the pike -- and a few do, now and then, given the fact we live in a world-class shopping capital -- but the Sergio Rodrigues shop-in-shop at Espasso Los Angeles, with its "Mad Men"-perfect, Brazil-swank furniture has caught our eye. And not just for style; Mr. Rodrigues is now 85, meaning he has achieved rightful icon status in the design world. Scott Morrison's Bespoke Jeans: We're used to seeing the word "bespoke" appear before elegant three-piece suits and fancy chapeaus, but jeans? Casual wear treated with TLC certainly isn't a new headline, but we so want to brag that our denim was custom-fit (rather than dug up from the bottom drawer, per usual; oh, dreams). Scott Morrison's 3x1 line is now appearing at Barney's and Ron Herman. Unveiled: Springtime and bridal shows go together like the two fancy-dressed figures standing atop a cake. But bridal shows are often confined to a convention center setting. That's a-ok, of course, but Unveiled will take to the Beverly Canon Gardens in Beverly Hills on Sunday, April 1. Makes sense, right, to eye the pretty and swank bridal goodies by sunlight? After all, many a happy bride makes her big debut in a flowery setting.